Midlothian Conservatives have selected their candidate for the Westminster elections on 8th June 2017. The candidate selected by the association is Chris Donnelly. 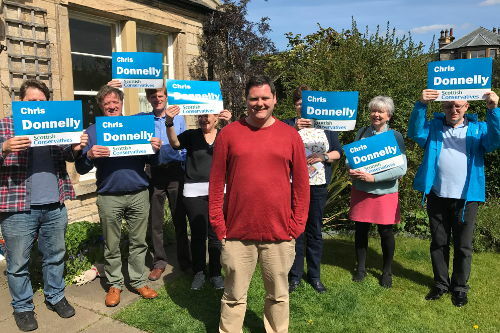 Chris has been involved with campaigning for the association since 2005 and has previously stood in elections for both Holyrood and Westminster. Midlothian Conservatives say they are exceptionally lucky to have such experience in house and couldn’t be happier with the members’ choice. “I am delighted and honoured to be selected to represent the Scottish Conservatives in Midlothian in the up coming General Election on the 8th June. We are running a hugely successful campaign across the county, with our council candidates working extremely hard for every vote. Many former SNP and Labour voters are heartily sick of the spectre of another vote on separation, and want to move forward to focus on local services and issues. SNP MP Owen Thompson has already declared that he is standing for re-election. Other parties are yet to decide their candidates.